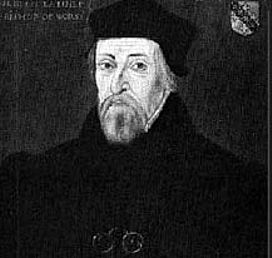 Bishop Hugh Latimer was one of the early evangelicals who led the English Reformation from Cambridge in the sixteenth century. This humble farmer’s son was put to death by the ruthless Catholic Queen Mary for his­ reformist views. He was burned at the stake, together with Nicholas Ridley, on 16 October 1555. Hugh Latimer was an unlikely convert to the Protestant cause. Born about the year 1491, he was brought up an only boy, with six sisters, living on a small farm at Thurcaston in Leicestershire. At 14, he went to Christ’s College, Cambridge, where he was an exceptional student. A decade later he was ordained priest in the Roman Catholic Church, after obtaining a fellowship at Clare College and becoming a Master of Arts. During his early years as a priest, Latimer was a zealous Catholic, opposing the Lutheran opinion of his day, and a bitter opponent of the English Reformation movement. At the age of about 30, he was made Bachelor of Divinity. True to form, his oration at the award ceremony was a public defence of the Pope’s authority. He also attacked the theology of Philip Melanchthon – the renowned continental reformer who was later to take the Protestant lead after the death of Martin Luther in 1546. However, their optimism was short-lived. After his oration his friend Thomas Bilney, a leader of the group of reformed Cambridge theologians, approached Latimer. He recognised Latimer’s honesty and sincerity and believed that his strong support of popery might be due to lack of knowledge. So he asked if he might be allowed to make a private confession of his own newfound faith. He soon became the most popular preacher of his day and one of the leading spokesmen for the Reformation. His homely practical sermons were strikingly simple, yet powerful and challenging. However, Latimer’s uncompromising beliefs attracted intense persecution. The Bishop of Ely, Dr Nicholas West, banned him from preaching in the university and the diocese. Even so, this did not silence him entirely as he was invited to preach in the Augustinian monastery, which was exempt from the Bishop’s jurisdiction. His opponents were still unhappy with this and they made charges of heresy against him. He was called up more than once to appear before Henry VIII’s chief adviser, Cardinal Wolsey. His accusers, however, were somewhat ignorant of Catholic doctrine and Wolsey judged that the allegations were trivial and merely personal. After gently reprimanding him, he restored Latimer’s licence and gave him authority to preach anywhere in England. Latimer first came to prominence by defending Henry VIII’s divorce from his first wife, Catherine of Aragon. He became a close adviser to the King and was made Bishop of Worcester in 1535. The King, however, was wary of the extremes of Protestantism. Latimer’s strong Protestant convictions lost him favour in 1539, when he refused to sign the King’s “Six Articles”, designed to prevent the spread of Reformation doctrines. He resigned his bishopric and was confined within the precincts of the bishop’s palace at Chichester until the death of Henry VIII. He remained in disgrace until the accession of the staunchly Protestant King Edward VI in 1547. As the English church moved in a more Protestant direction, he regained favour. He began preaching in his eloquent and lucid style against the abuses of church and clergy and was court preacher until 1550. During Edward’s reign, Latimer resided with his friend, Thomas Cranmer, continuing to play his part as a major figure in the English Reformation. His freedom to preach came to an abrupt end when the King died and the ruthless Catholic Mary Tudor took the throne in 1553. One of her first acts was to imprison the leading reformers. Along with Cranmer and Nicholas Ridley, Latimer was arrested, tried for heresy and imprisoned in the Tower of London. On 16 October 1555, Latimer and Ridley were burned at the stake in Oxford. Six months later, Thomas Cranmer was also burned at the stake in Oxford. Of almost 300 people burned by Mary’s orders, the most famous are the Oxford martyrs. The Martyrs’ Memorial in the city centre commemorates the “faithfulness unto death” of these three great Protestants.